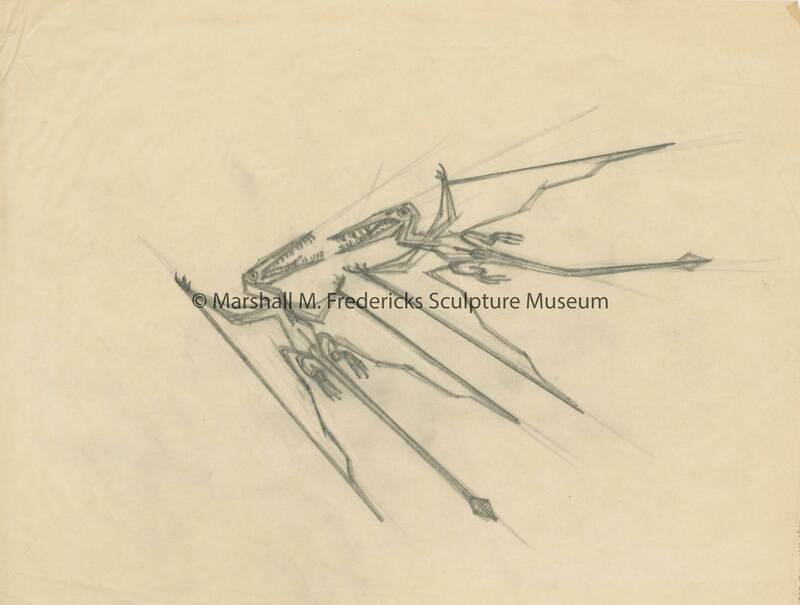 Marshall M. Fredericks Sculpture Museum | Sketch for "Flying Pterodactyls"
Original sculpture done in 1960 for Holden Museum of Living Reptiles, Detroit Zoological Institute, Royal Oak, Michigan, Charles N. Agree, architect. Sculpture depicts two pterodactyls in flight while fighting over a fish. They are stylized and angular. They have sharp teeth and long tails. Fredericks, Marshall M., 1908-1998, “Sketch for "Flying Pterodactyls",” Marshall M. Fredericks Sculpture Museum, accessed April 21, 2019, http://omeka.svsu.edu/items/show/6705.